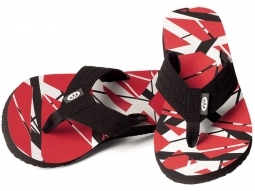 Board Shorts featuring Eddie Van Halen's iconic 'Frankenstein' stripes! As seen on Taylor Hawkins! He ordered them from Van Halen Store, and wore them at nearly every Foo Fighters concert in 2018! Small 28-30" 33" 20.75" 7.75"
Medium 32-34" 36" 21" 8"
Large 36-38" 37.5" 21.5" 8.25"
XL 40-42" 40" 22" 8.50"
2XL 44-46" 42" 22.5" 8.75"
3XL 48-50" 46" 23" 8.75"
WAIST, LABELED: Size printed on the label of the shorts. WAIST, ACTUAL: ACTUAL CIRCUMFERENCE of the waist of the shorts. LENGTH: Distance from the top of the waist to the bottom middle of the leg. INSEAM: Distance from crotch (where the front and back seams meet) to the bottom of the leg. 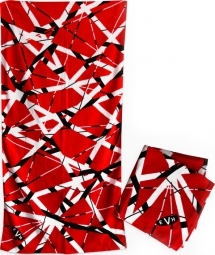 I own these new EVH board shorts, and also the original ones released in 2016. This newer one is better. The red and black colors are the same as the old ones, but the white stripes are pure white, as opposed to the old shorts, which were not as white (some red bleeding). And, I'm very glad they added a pocket. Also I like the striped pattern better on these new shorts better than the original shorts, too. A great item. No complaints. Ordered as a gift for someone and they are super friggin awesome! !